0 Comment January 13, 2019 Like? With all of these new features, OBS users can add more video production capabilities to their live streams. But there is more! PTZOptics has just published a new list of HTTP camera commands that are available for use with OBS and other video production software that supports web browser inputs. These new HTTP camera control commands allow OBS users to automate camera pan, tilt and zoom movements based on a selected OBS scene. OBS users can simply enter a web-browser input with e HTTP camera control string to control advanced PTZOptics camera operations including pan, tilt, zoom, focus, preset positions, and OSD menu navigation. The new HTTP-CGI Command Sheet is now available for use at PTZOptics.com/Downloads. When you input your HTTP PTZOptics camera commands into your OBS web browser input remember to click the checkbox to refresh browser when the input becomes active. It’s worth mentioning that after this video was posted the PTZOptics team has added support for hotkeys. Users without an XBox joystick can use their keyboard with W, A, S, D, keys to control the pan and tilt operations of the camera. Hotkeys 1-9 are used to recall camera presets. If you use OBS hotkeys to manage your Open Broadcaster Software production you can use the PTZOptics hotkeys to sync up PTZ camera control and scene switching automation this way as well. PTZOptics also offers a free course on OBS available on UDEMY for coupon code “OBSFree” at this link - https://www.udemy.com/obs-live-streaming-course. Learn how to automatically call PTZ camera presets with OBS Scenes and the new XBox controller for OBS here. Here’s how you can bring in RTSP video streams into OBS here. Check out the new PTZ camera control plugin for OBS here. Learn how to use OBS with the NewTek NDI here. Checkout the latest version of OBS in this software overview for beginners with the StreamGeeks here. Take our complete course on OBS (Open Broadcaster Software) with coupon code: OBS Free here. Learn more about the PTZOptics OBS Plugin in the OBS Forums here. 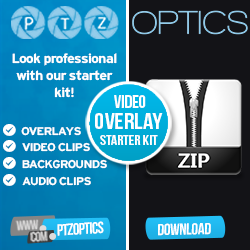 A complete review video from PTZOptics on the OBS PTZ Camera Control plugin is found here.